2 Bedroom 2 Bathroom Directly Across From The Village. Walk To The Mountain. Our Unit is a 2 Bedroom Condo with concierge service located directly in the lobby of the building. The Long Trail House is located directly across from Stratton Village where you can walk to the base lodge and lifts. You can park your car in the heated garage of the building (1 spot available and never have to drive your entire stay) Walking distance to all restaurants and shops and spa all located in the village. Condo details-Living room with gas fireplace and flat screen TV, pull out queen size bed sleeps 2 Kitchen with eat in area as well as dining room. Master Suite has a queen size bed, flat screen tv, with a full bath. Second bedroom as a full size bed which also sleeps two. Second bathroom is a full bath. Balcony with access from living room as well as second bedroom offers great mountain views. Access to owners lounge in lobby of building as well as heated outdoor pool and two jacuzzis. The heated pool is great for kids after a long day skiing on the slopes! Other amenities: private ski locker and wireless internet. Access to health club and pool as well as golf course. Our family enjoys skiing and we have been vacationing in Stratton for many years. We have stayed at many different properties in Stratton and fell in love with the location of the Long Trail house. It is directly across the street from the village and main ski lifts. We love that we don't have to drive at all! We love our condo and have had many wonderful family vacations. We hope that you enjoy your stay with your family and treat our condo like it is your own. We fell in the love with the location of this property as well as what the long trail house has to offer. We love that you are in walking distance to the main ski lifts and resturants and shops. We also love that at the end of a long day of skiing, the kids can swim in the heated pool or ice skate on the pond directly behind the building. We love the fact that we can also always drive to manchester for different restaurants or also shop at some of the outlets. toilet, combination tub/shower, tub, shower, seconde bathroom is located in the master bedroom. Air Conditioning is in the main living areas-Living Room, Dining Room and KItchen. The Bedrooms are not air conditioned. 1 parking spot will be provided and parking is in the heated garage located under the building. All towels will be provided in unit and towels are provided for the pool by the building. Access to fitness center where one can avail of the indoor pool, full gym, squash and racquet ball courts. Very comfortable living room with pull out couch. Kehrig coffee maker in unit. Coffee is served int he lobby of the building on the weekends. One 48' flat screen TV located in living room. Flat screen TV's in both bedrooms. Great variety of family movies. Patio/balcony with access doors from living room and second bedroom. 2 hot tubs located outside building in pool area. We loved (and used) the Rec Center passes, the convenience of walking across the street to ski, shop, have coffee, or dinner. 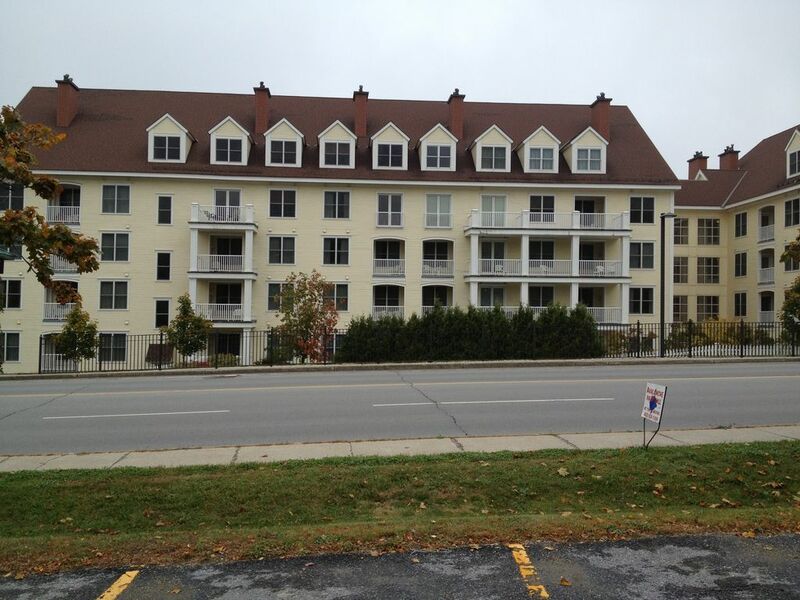 Perfect location, great amenities and clean/modern unit. Everything we wanted for our ski trip - thank you so much! We’ll be returning next year! This is our second time renting this condo and we will certainly be back. Condo is super clean, has an awesome location, and is spacious. Rental process was seamless and Jennifer was always so quick to respond to any questions. Thank you Jennifer! We had a great time at Stratton. The condo was everything we could have wanted. A short walk across the street to everything. Also enjoyed the outdoor hot tub. The skiing wasn’t great because of the weather, but no control over that. Would definitely do it again. The things that make this building special are the location, underground parking, ski lockers, concierge, complimentary morning coffee, hot tub. This unit is very clean, nicely decorated, has a gas fireplace, the beds/bedding/pillows were good quality and very comfortable. The owner was immediately available and responsive to a few questions I had. Loved being so close to the heart of the action. The unit was spacious with nice windows. Very comfy. The Landlord reserves the right to rent to others or not to rent at all until payment is made and landlord delivers fully executed lease to tenant. Rent, room tax, security deposit and cleaning fee must be payable upon tenants signing of lease.